Eyre Peninsula farmer Garry Baines has expanded his crop options since using Liquid Systems (SA) equipment to resolve copper deficiencies in his soil. 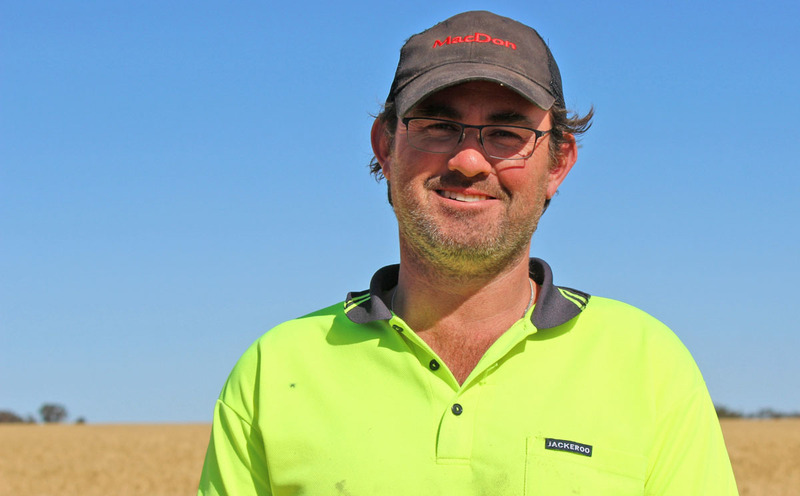 Injecting liquid trace elements in-furrow has allowed Ungarra farmer Garry Baines to reintroduce wheat into his rotation, following a six-year break from growing the profitable cereal crop. And my wheat is nice and healthy. Last year I had wheat crops yielding 4 to 5t/ha. Other paddocks only did a bit over a tonne per hectare, but that was on my very harsh, shallow soil types. I’m very happy to be able to bring another crop back in. It spreads out my harvest, grain and marketing options. Garry crops wheat, barley, lupins and canola on soil types that range from good loams to exposed limestone and non-wetting sands. Prior to adopting Liquid Systems’ (SA) Ai120 and Spiker modules in 2014, he applied trace elements via boom and aerial spraying, which he continues to do for broad leaf weeds in cereal crops. The addition of in-furrow liquid injection means the trace elements are immediately available to the plants, according to Garry. “The earlier you can make trace elements available to the plants the better,” he said. “Liquid application means we can get more trace elements into the ground where we need them. The earlier you can make trace elements available to the plants the better. Liquid application means we can get more trace elements into the ground where we need them. “When you apply copper solution as a foliar application you have to wait for it to work into the ground, which can be six or seven years down the track, because copper is very immobile in the soil. “I’m putting liquid copper at a depth of 25mm, which means the solution is in the ground at plant root depth. “Various trial results have shown that copper is a big winner. In a copper versus no copper trial I heard about, it was suggested that while the crops all looked the same, there was a 3 or 4t/ha yield difference, just from copper being available to the plant. That’s dollars in the bank.” During three seasons using the liquid system, Garry has made progressive changes to products and liquid rates to continually improve soil health and reduce expenditure. He found the amino acid chelate applied in the first year lacked sufficient amounts of trace elements. In 2015 he switched to pre-mixed 1000l shuttles of zinc, manganese and copper sulphate solution, sourced from South Australia’s LiquidAg, as well as 20l of UAN. This year Garry purchased copper, zinc and manganese sulphate in powder form and mixed batches prior to seeding, as a cost-saving initiative. He sourced 150g of copper and 500g each of zinc and manganese, creating 8000l of trace elements in liquid form. This cost Garry about $105 per 25kg, whereas premixed solutions cost $3-$4 per litre. “I’m trying to push the rates higher, keep the costs down,” said Garry. “I mixed 8000Lt of trace elements this year before seeding, whereas I used 3000Lt in the first two years. Now that I understand the system, I want to keep pushing the rates to hopefully reduce soil disease and improve soil health.” He also applied phosphoric acid this year, to see the impact of a different form of P in the soil, and used the Spiker module to inject the fungicide Flutriafol. To store, mix and cart the liquid products, Garry uses an existing 25,000Lt heavy duty poly tank, which he uses in the foliar application of UAN. He also purchased a second-hand boom spray to cart the products to the paddock during seeding and modified this by removing the booms, converting it to a portable batch tank. Garry upgraded his seeding rig at the same time of purchasing the Liquid Systems (SA) equipment, converting from a tine machine to a 10.5m hybrid seeder with 318mm spacings from Cross Slot in New Zealand. To create sufficient downward pressure for penetration, he mounted the liquid tanks on the seeder bar, rather than the air cart hopper. Liquid Systems (SA) and Cross Slot worked together to engineer the correct weight distribution and Garry created and fitted the frames to mount the tanks. Another adjustment was the inclusion of stainless steel pipes to surround the liquid feed hoses, which prevent liquid coming into contact with the disc. “Liquid can cause the disc to stop turning, so Peter Burgess from Liquid Systems and John Baker, the CEO of Cross Slot liaised with one another to get this right,” said Garry. Garry has been impressed with the level of support from Liquid Systems (SA). “I know this liquid system isn’t the cheapest on the market, but it’s the best quality and you receive the best support,” he said. “Their understanding of the computer componentry in all the different computer systems that farmers use is fantastic. “I’m using John Deere’s GreenStar system to control my liquid set-up and when I was working out the calibration, the guys at Liquid Systems explained the breakdown of the calibration numbers and helped me slow the pressure regulating valve so that the rate adjusts with any changes to ground speed.” This feature is particularly important on Garry’s variable soil types. “My seeding speed is irregular due to my soil’s high variability. It changes from 5km/hr over stony ground, up to 13km/hr. The system seems to be able to keep up with huge variations in ground speed,” he said. My seeding speed is irregular due to my soil’s high variability. It changes from 5km/hr over stony ground, up to 13km/hr. The system seems to be able to keep up with huge variations in ground speed. Plus, you have control over the rates you put into your soil. With Flutriafol, if you apply it pre-applied to a fertiliser, you’ve got to sow it at the preset rate, such as 100kg/ha, whereas with the liquid system you have full control of the rates.